Liverpool lock horns with Bournemouth this weekend, but do Cherries supporters sense an upset that would hamper their Premier League title bid? Jurgen Klopp and his players have not enjoyed a productive time of things since returning from Dubai, drawing both matches and looking a shadow of their former selves. 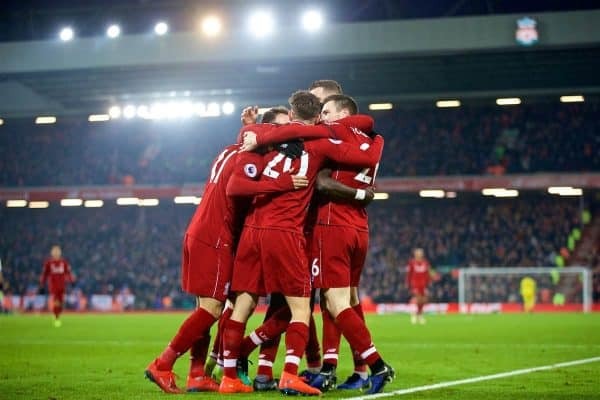 There is no need to panic, however, with destiny still in their own hands and a chance to return to the top of the Premier League on Saturday. 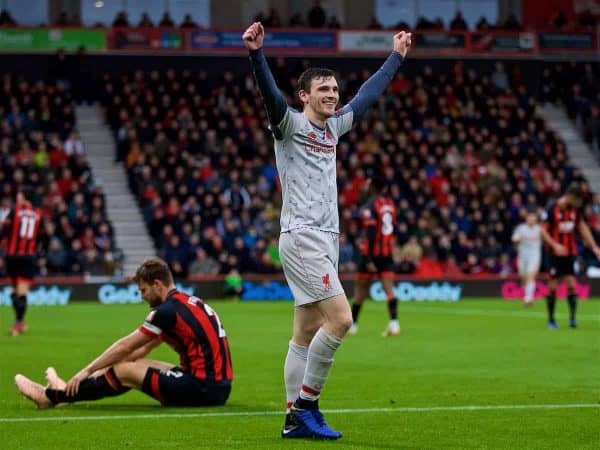 Standing between Liverpool and victory is a Bournemouth side now a mid-table outfit in their own right—one who could pose a similar threat to Leicester and West Ham. Ahead of the match, we spoke to Cherries supporter and author Peter Bell (@CherryChimes) to get his view on Saturday’s clash and whether or not he thinks the Reds will be champions in May. Bournemouth are 10th in the Premier League – how happy are you with the season so far? It has been another strange season for Bournemouth fans. We were certainly excited in the first weeks when we had 20 points from 10 games, then we hit December against the big teams. Form and results fell off very quickly. Things might not have dipped as much had we not picked up so many injuries, but with Adam Smith having been out for a couple of months and Lewis Cook and Simon Francis out for the season, it has been tough going. Being in 10th is a fairly good position after all that. 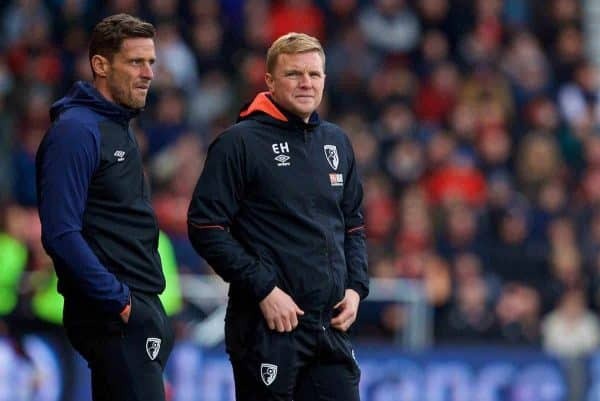 Do you still feel like Bournemouth are progressing under Eddie Howe? There is definite progression still. The addition of Jefferson Lerma in central midfield and David Brooks on the wing, or playing as a No. 10, has taken the club up a level. 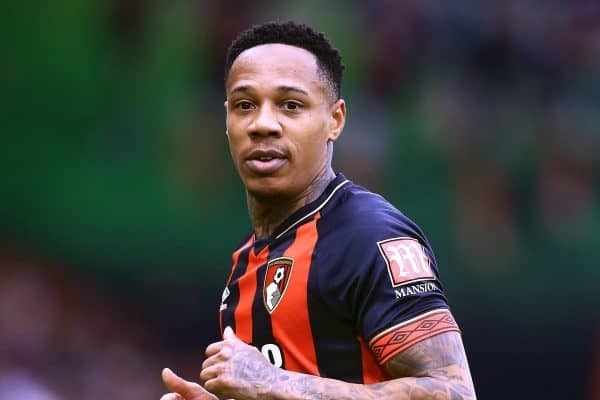 The signing of Nathaniel Clyne was also a real eye-opener in terms the type of players we can now attract. When Bournemouth are playing well we can really take teams apart, with Chelsea and Watford both on the receiving end of that. We still make individual errors at the back, though, and there are days when the team doesn’t get into any rhythm, as the defeats to Burnley and Cardiff show. Which three players have stood out most for you this season, and why? David Brooks – He is such an imaginative player, creating chances and scoring goals himself. We look a much poorer team when he is not playing. 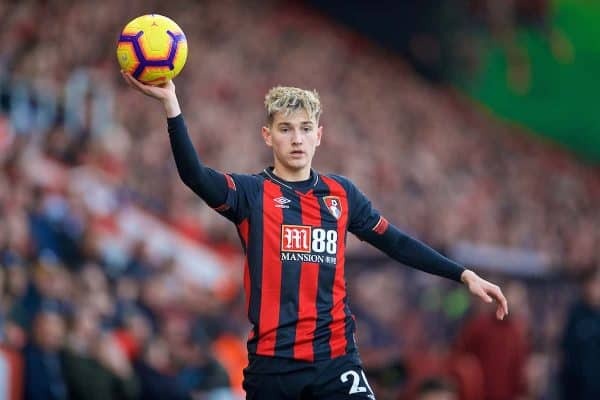 He is going to be a fantastic player, which is great news for Wales and hopefully Bournemouth, if we can keep hold of him. Jefferson Lerma – We didn’t know what to make of spending £25 million on a Colombia international who we hardly saw do anything amazing in the World Cup. But Lerma is a strong player and really gets about the opposition. He is very good at winning the ball back and has the physical presence we needed in midfield against the top teams. 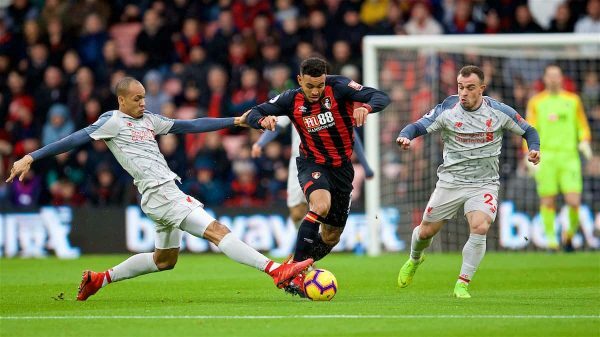 Callum Wilson – He is finally getting a full Premier League season under his belt and has become much better at heading the ball, while his power and ability to drive at goal is tremendous. His strike against West Ham at the London Stadium was fantastic, running from halfway, and he has become more confident since his England callup. Any who have been particularly poor? 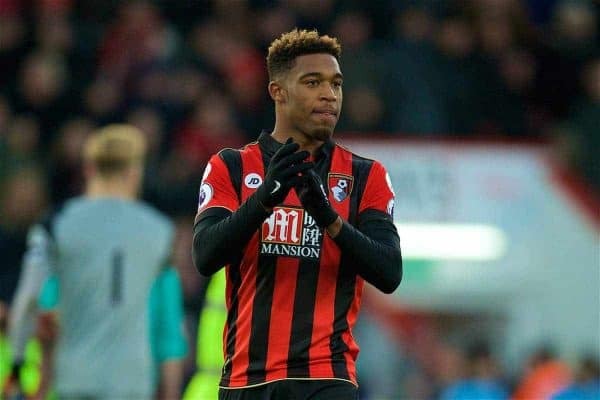 Ex-Liverpool man Jordon Ibe has to be among the disappointments again. Two League Cup goals are fine but we need more from him, whether it be his consistency on the ball or his general performance levels. He blows hot and cold, but mainly cold! Summer signing Diego Rico has been disappointing at left-back and he has only made three Premier League appearances. I just have my fingers crossed that Dominic Solanke is not another player that we will be moaning about next season. How has Clyne fared on loan so far? Clyne has been the perfect professional. He has a real appetite to do well and he is showing in games how strong he is at getting up and down the wing. He likes to get a few tackles in as well and was our best player in our last match at Cardiff, in my opinion. It is the consistency of his performances that I like. Bournemouth need that kind of player in their back four. He has impressed the fans so far, I’m sure of that. I hope Liverpool let him join us permanently in the summer, for a fee of around what we paid for Nathan Ake (£25 million), or preferably less! 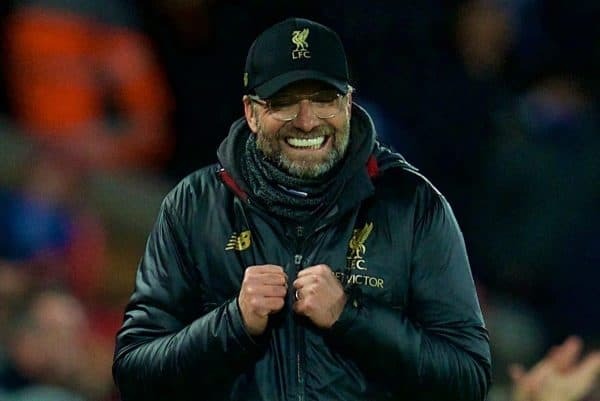 I would have to give Jurgen Klopp a 10/10 so far this season. I know Liverpool fans will say there has been the odd hiccup, like the FA Cup result at Wolves and the draws with Leicester and West Ham, but to be ahead of Man City and Spurs past the halfway mark is as good as they have done since Brendan Rodgers went close. I think Klopp can do better than be a runner-up, he just needs to keep motivating his players and pray for no more injuries. Liverpool should focus on the league if they want to win it, letting the Champions League go in the process. It’s too much to expect to win both. If Bournemouth take points off Liverpool and they lose the title by less than three points I would be disappointed that we helped Man City or Spurs to the title. 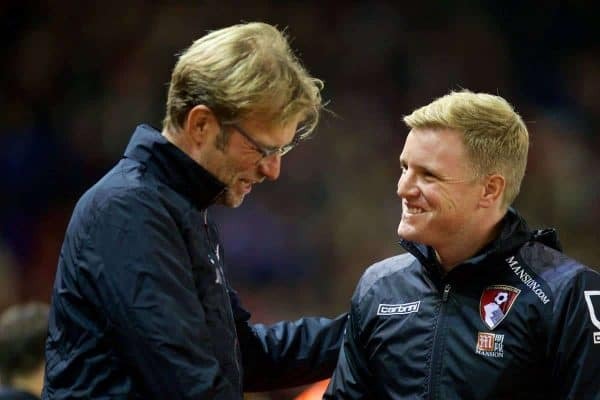 Everything that they do is a fantastic blueprint for how English teams can enjoy their football and win games and I believe Eddie Howe loves watching and playing Liverpool more than any other team. So, can you win it? Yes. Will you win it? You must. If the Reds don’t do it this season it may put you back a few more years. The 11 players on the pitch and the seven substitutes could be a problem! What can I say? Liverpool have players that are more expensive in every position and they have more experience in most cases. The front three of Mohamed Salah, Sadio Mane and Roberto Firmino are the most likely to score against us, which makes them an obvious threat. I like Andy Robertson at left-back and I hope we see Trent Alexander-Arnold on the pitch again. If those two play and get up the pitch it is going to be very difficult for Bournemouth to create much. Bournemouth‘s best hope is that there are mistakes at the back from Liverpool, most notably from Dejan Lovren if he plays. 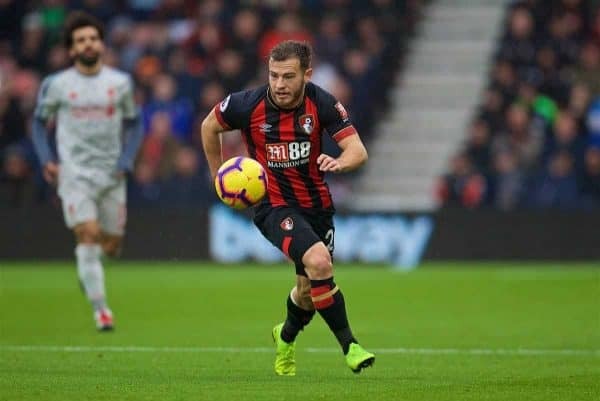 Josh King and Ryan Fraser will need to take the one or two opportunities they might get. Bournemouth have lost their last seven away games and we come up against a Liverpool side who are angry about not picking up maximum points in their last two matches. A recipe for a sound beating, don’t you think? I can’t see anything better than a 2-0 or 3-0 defeat for Bournemouth in this one, but there is no shame in that.